NOAA Fisheries announces a final rule to allow fishing for and retaining the recreational bag and possession limits of king and Spanish mackerel in the Gulf of Mexico (Gulf), South Atlantic, and Mid-Atlantic on a vessel with a federal commercial permit for king or Spanish mackerel when commercial harvest of king or Spanish mackerel in that zone or region is closed. The final rule will be effective on August 31, 2017. Previous regulations prohibited a person aboard a vessel with a federal commercial permit for king or Spanish mackerel from recreationally fishing for king or Spanish mackerel in federal waters if commercial harvest for the species is closed. An exception allowed a person aboard a vessel with both a valid coastal migratory pelagic charter vessel/headboat permit and a valid federal commercial permit for king mackerel or Spanish mackerel to recreationally fish when the commercial season is closed, if the vessel is operating as a for-hire vessel. No such restriction exists for any other species in the Gulf or South Atlantic. This rule removes the restriction entirely, allowing vessels with commercial king or Spanish mackerel permits to fish recreationally for king or Spanish mackerel when the commercial season is closed, regardless of whether they are fishing in a private or for-hire capacity. FORMAL FEDERAL REGISTER NAME/NUMBER: 82 FR 35658, published August 1, 2017. Why was the prohibition to restrict commercial vessels from retaining recreational bag limits originally implemented? 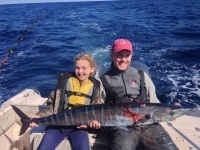 - The regulations were originally considered necessary when the Gulf migratory group of king mackerel was thought to be overfished (population too low) in the early 1990s, as a means of controlling fishing effort. Why is this prohibition changing? - The most recent population assessments of king and Spanish mackerel indicated that both Gulf and Atlantic migratory groups are not overfished and not experiencing overfishing (too many being caught each year). These regulations are now consistent with other species in the Gulf or South Atlantic. Where can I find more information on Framework Amendment 5? - Framework Amendment 5 may be found online at the NOAA Fisheries Southeast Regional Office Web site at:http://sero.nmfs.noaa.gov/sustainable_fisheries/gulf_sa/cmp/2017/framework_am5/index.html.